From time to time we are checking the internet for what people say about Viva-Lite. That way we can learn a lot how our customers perceive our brand, products and services. “We planted Tulasi at home last summer. When she was very little we bought her a 26 W Viva-lite full-spectrum bulb. She was doing well with it. She grew very strong stalk and large, green leaves. Recently we felt she needs more light. We arranged two 36 W fluorescent Viva-lite tubes for her. In Scandinavia there is hardly any natural light at this time of the year! As far as I’ve understood, plants benefit mostly from certain wavelengths of light. In order to grow nicely, they need more cool or blue light. When they are blooming, they require some red wavelengths, too. Visual color temperature is measured by the degree of Kelvin. 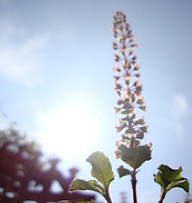 That’s what you have to pay attention to when choosing light for Tulasi. Full-spectrum lights are as close as it artificially gets to a natural mid-day sun during the late summer. Viva-lite bulbs/tubes have 5500 K which resembles normal daylight. They imitate all wavelengths of light to some degree. Because they have a very high color rendering index (CRI), they don’t distort the actual color impression around them. Lights that have low CRI make everything look weird, either yellow or strangely blue. We couldn’t agree more. Visit namahatta.org to read the full article. This entry was posted on Monday, April 26th, 2010 at 8:44 pm	and is filed under Best Practises, Testimonials. Both comments and pings are currently closed. Hello there, just wondering how I can contact the owner of this site? I own my own health website and was interested in featuring your site.